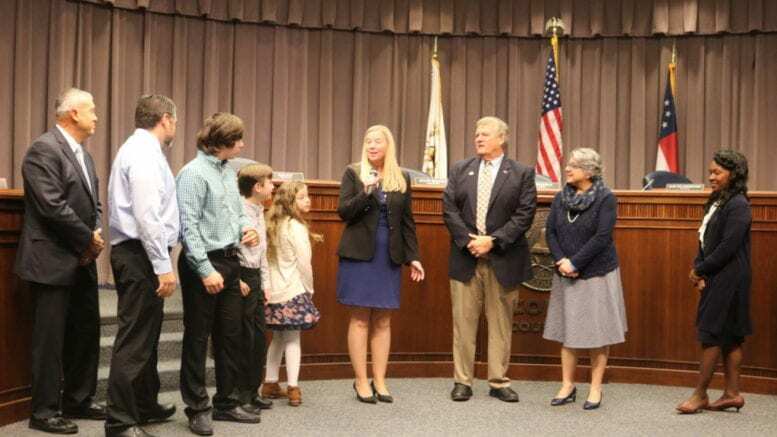 Erica Parish, who has been the interim director of the Cobb County Department of Transportation, was named to the post on a permanent basis by the Cobb County Board of Commissioners at their meeting Tuesday morning. According to Hosack, several candidates for the position had been interviewed by a panel led by Tony Hagler, Cobb County’s Human Resources director. Other panel members were Annie Gillespie, the Director of Engineering of the State Road and Tollway Authority; Dana Johnson, Cobb’s Community Development Agency Director; Dr. Jackie McMorris, Deputy County Manager; Ed Richardson of Richardson Management Group; and Tammi Saddler Jones, the City of Smyrna’s City Administrator. The panel narrowed the field to four candidates for further consideration, and Parish was recommended as the best candidate for the job. Parish came to Cobb County in 2016 after 15 years with Paulding County’s Transportation Department. She holds a degree in civil engineering from Southern Polytechnic State University (now part of Kennesaw State University). The Department of Transportation (DOT) develops, manages, and operates the county’s transportation systems. Those systems include a vast network of roadways, sidewalks, and trails; a transit system that provides public transportation; and a general aviation airport that serves business and recreational flying needs. Be the first to comment on "Erica Parish named Cobb DOT director"